Glancing memoir of a young man’s religious infatuations and their sometimes baleful consequences. Gartenstein-Ross, now a counterterrorism consultant, was a college student a decade ago, inclined to philosophy, soul-searching and dorm-room arguing about the meaning of life. “And strange as it may seem,” he writes, “my debates with fundamentalist Christians were milestones on the path to radical Islam”—a path made less obvious by virtue of his “Jewnitarian” upbringing. Through a roundabout spiritual quest, and encouraged by a Muslim classmate, Gartenstein-Ross came to Allah, convinced that “the true Islam was moderate.” His contacts with Muslim radicals at college and at home in Ashland, Ore., suggested otherwise, particularly in the latter spot, where he found himself among an unlikely bunch of outdoorsmen, “half redneck, half hippie, and one hundred percent Islamist.” Doctrine is one thing and the real world another. As he goes to work for the al-Haramain Islamic Foundation, a Wahhabi charity later charged with funding terrorist organizations such as al-Qaeda, Gartenstein-Ross is schooled in a piety that sometimes clashes with the quirks and inconsistencies of his fellows. Still, he becomes a Muslim puritan, tossing out his rock cassettes and becoming “more amenable to the idea that sharia, or Islamic law, was the best way to govern a society,” with all its fiery condemnations of gay people, unveiled women and assorted infidels. He becomes less certain of the cause once he learns of the fate of apostates, all the while praying simultaneously for mujahedeen victory in Chechnya and an end to anti-Semitism among his fellow believers. His memoir takes a turn toward the mawkish when he goes to a Yankees game and finds himself pondering the deeper meanings of the song “New York, New York,” which in time sets him off on another path—converting to Christianity. 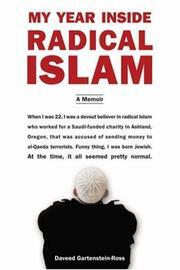 Far less revealing of the workings of radical Islam than of a youngster’s manifold confusions.